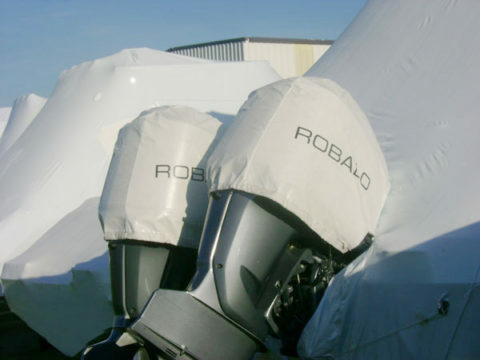 Commercial Sewing manufactures outboard motor covers for both shipping protection and off-season storage purposes as well as stylish outdoor covers that protect motors while on the water. Our styled motor covers are finished product accessories that complement the mooring cover. It protects the cowling from abuse during towing and environmental damage. Being separate from the mooring cover allows flexibility so if a motor change was desired the mooring cover would not be affected. Available through most dealer networks.